Gliffy is a great Chrome app for creating diagrams and flow charts. And although it has some slight shortcomings such as the absence of vector-based output format and that the app still does not support direct printing, Gliffy remains one of the best diagram making option for teachers. It has an intuitive interface and a very good editor that can work with no Internet connection. Using Gliffy, you will be able to create a wide variety of shapes that include: flowcharts, org charts, UML, network diagrams and many more. 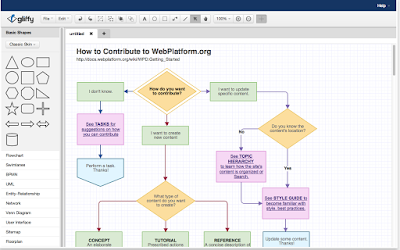 Users can also save their diagrams into PNG or JEPG formats and use them in Google Docs, presentations, or even embed them in a wiki or A webpage. To print a diagram, you will have to convert the file into a different format such as Word doc. You can use diagrams for a variety of purposes that include ”Illustrate the flow of data; Improve communication; Clarify a new process; Document an existing process; Show key relationships within an org; Expose potential process bottlenecks”. 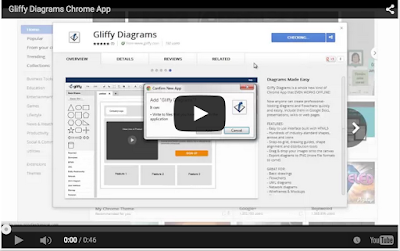 Watch the video below to learn more about Gliffy.